While we bust our heads day and night studying hard to get a degree, 12 Bahrainis, according to Arabian Business, paid money to get certificates in the mail. It is so despicable that I had an immediate urge to publish the names in BOLD. The disclaimer on the American magazine that published the list made me retreat. Coincidently, University of Strathclyde, where I'm doing my MBA, sent us an email invitation for a very important meeting this weekend to address a similar issue. It seems that some of their students have been buying custom written assignments from individuals in Bahrain who make a business out of preparing bespoke MBA assignments. No wonder we have all kinds of morons in executive jobs all over the country. To stop or, to control at least, these morons into seeing light in corporate lives, there should be some similar IQ/EQ kinda of tests for every disciplines they claim that they earned. p.s. Eshhhhhh Ministry of Education is in LALA Land.. 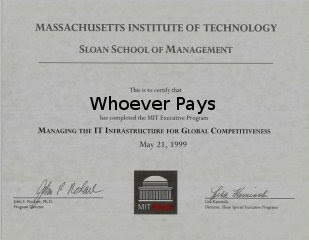 haha...I've seen some jokers in my laugh, but none beat the executives with fake degrees/degree mill degrees. They're completely self-delusional! *Hilarious...I was laughing as I typed the above, and instead of life I wrote laugh :) Oh wellsies. Maybe you would have been better off buying a degree from somewhere like MIT than going to the University of Strathclyde! :) I can't understand why people waste their money on crappy schools!